Experience some of New England’s finest cross-country skiing in the heart of Vermont’s unspoiled Northeast Kingdom. Spend the week with our expert instructors developing your Classic style Cross-country skiing technique, otherwise known as Diagonal Stride Technique. This program may be an introduction to cross-country skiing or a refresher course to hone your skills at every ability level. Whether your goal is physical training or exploring Vermont’s scenic treasures, you’ll have extensive options on trails that are wide, expertly maintained and groomed daily for classic and skate ski techniques. The educational focus for the week is live music & dance. There will be live performances on evenings 2, 3, 4, & 5. In addition to cross country skiing, participants will have the opportunity to do snowshoeing and skate skiing. - Enjoy time with cross-country skiing instructors who offer easy-to-follow advice for skiers of all abilities. - Snowshoe through the pristine wilderness surrounding a “green” facility, and enjoy nutritious meals prepared with locally sourced ingredients. - Take part in classes, live music performances, social events, and educational programming to stimulate your mind and body after the day’s exhilarating outdoor activities. “Spirited.” Two ski classes per day; ski 6-12 kilometers per day. The Craftsbury Outdoor Center's main Cedar Lodge offers traditional dormitory style rooms with either two twin beds or a double bed. Upgrade options are available including rustic Lakeside Cottages, Suites, and our newly built Hillside Cabins. To book your trip, simply call: 800-454-5768. 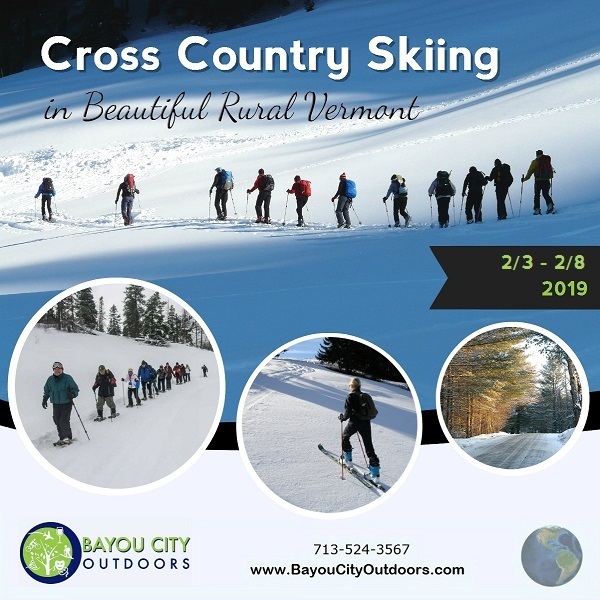 You will need to reference the program number, name, and departure date: #20276 – Cross Country Skiing in Beautiful Rural Vermont, for January 27-February 1, 2019 FEBRUARY 3-8, 2019! Please tell them, you are from Bayou City Outdoors. In they system it looks like they have named our group the “Bayou City Travelers,” so if for some reason “Bayou City Outdoors” doesn’t register with the folks in the call center, try “Bayou City Travelers.” There should not be any problem, but just in case. Check the terms and condition here. To learn more, please contact your Event Leader, Paulette! note: Winter Carnival in Quebec City starts on February 8th, the day the ski program ends. I’m looking to see if we can connect these two activities since we’ll be so close to Canada as it is. More on this later.